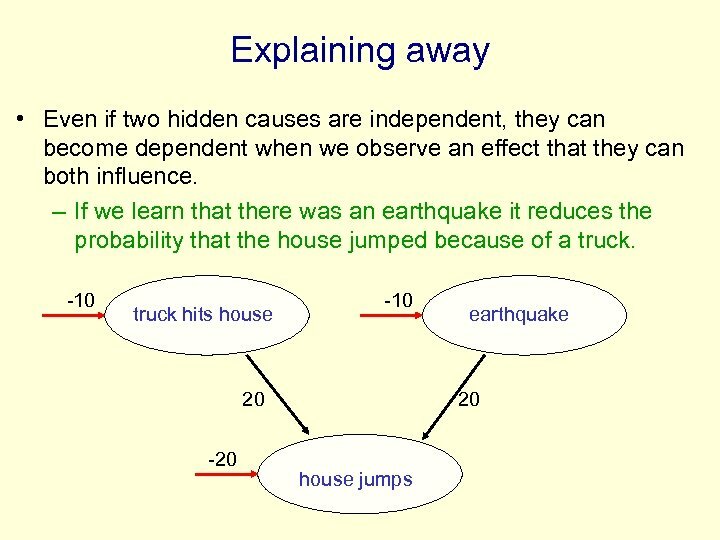 Discovering causal structure as a goal for unsupervised learning • It is better to associate responses with the hidden causes than with the raw data. • The hidden causes are useful for understanding the data. 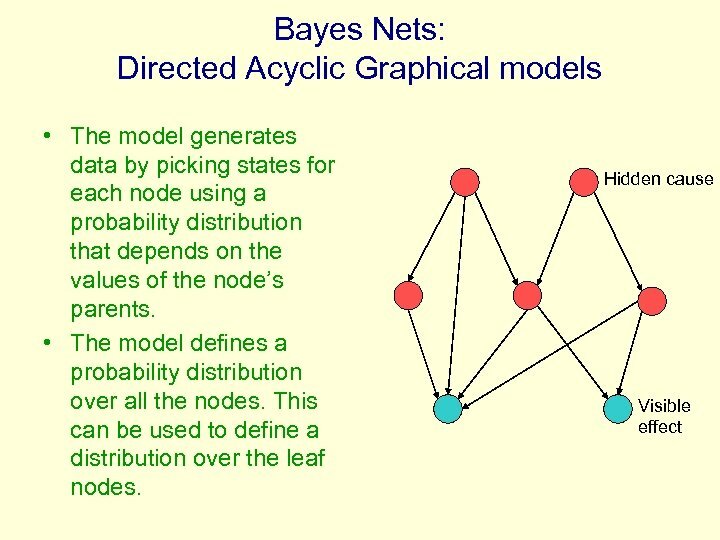 • It would be interesting if real neurons really did represent independent hidden causes. 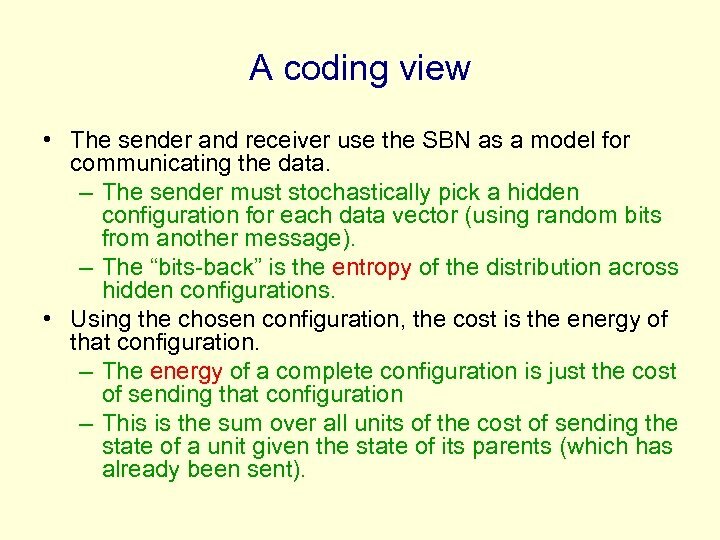 A coding view • The sender and receiver use the SBN as a model for communicating the data. – The sender must stochastically pick a hidden configuration for each data vector (using random bits from another message). 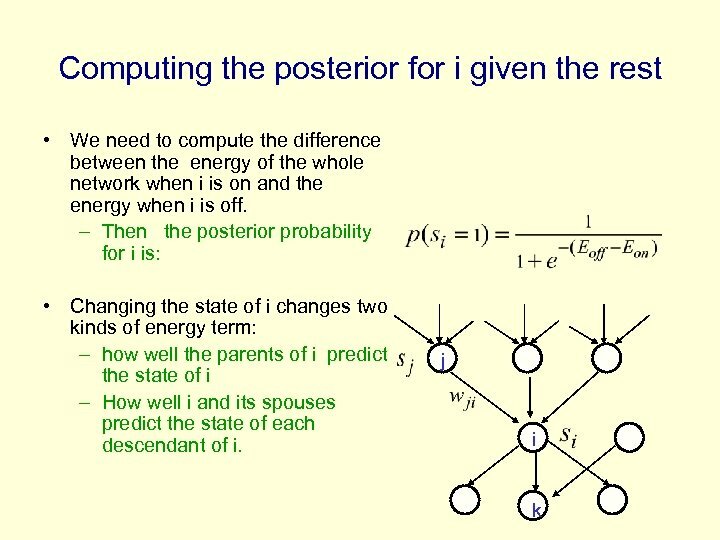 – The “bits-back” is the entropy of the distribution across hidden configurations. • Using the chosen configuration, the cost is the energy of that configuration. 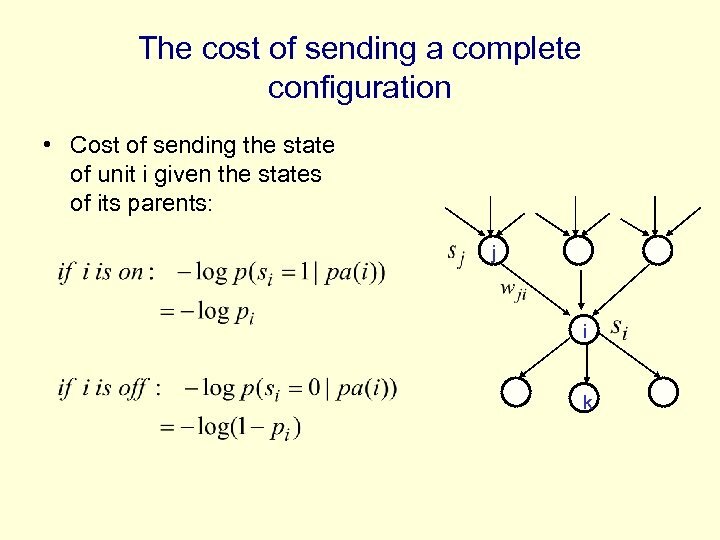 – The energy of a complete configuration is just the cost of sending that configuration – This is the sum over all units of the cost of sending the state of a unit given the state of its parents (which has already been sent). 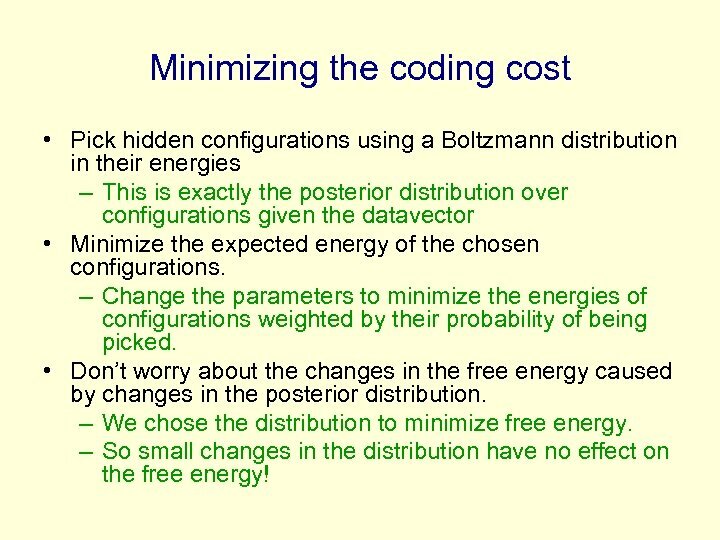 Minimizing the coding cost • Pick hidden configurations using a Boltzmann distribution in their energies – This is exactly the posterior distribution over configurations given the datavector • Minimize the expected energy of the chosen configurations. 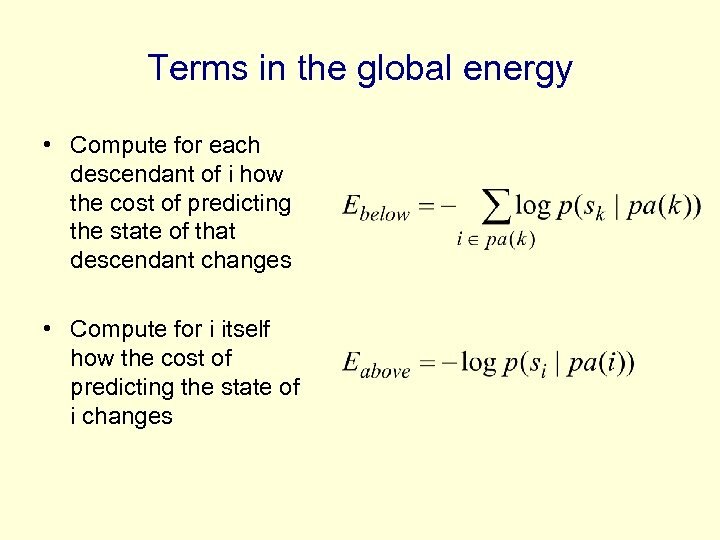 – Change the parameters to minimize the energies of configurations weighted by their probability of being picked. • Don’t worry about the changes in the free energy caused by changes in the posterior distribution. – We chose the distribution to minimize free energy. – So small changes in the distribution have no effect on the free energy! 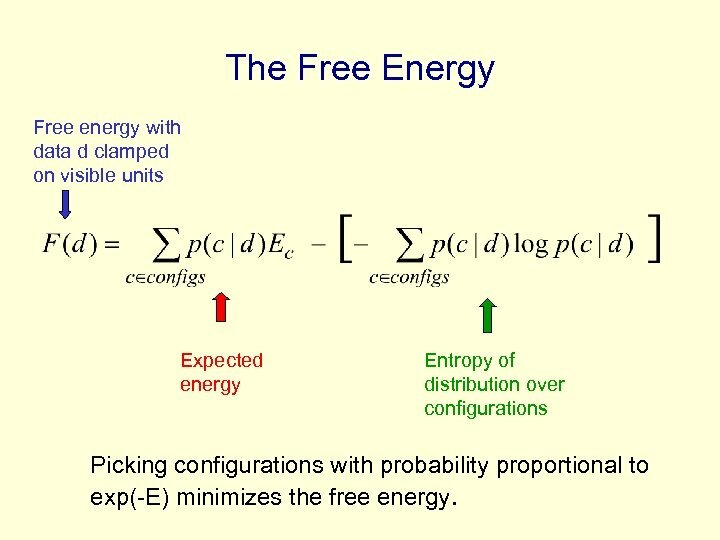 The Free Energy Free energy with data d clamped on visible units Expected energy Entropy of distribution over configurations Picking configurations with probability proportional to exp(-E) minimizes the free energy. 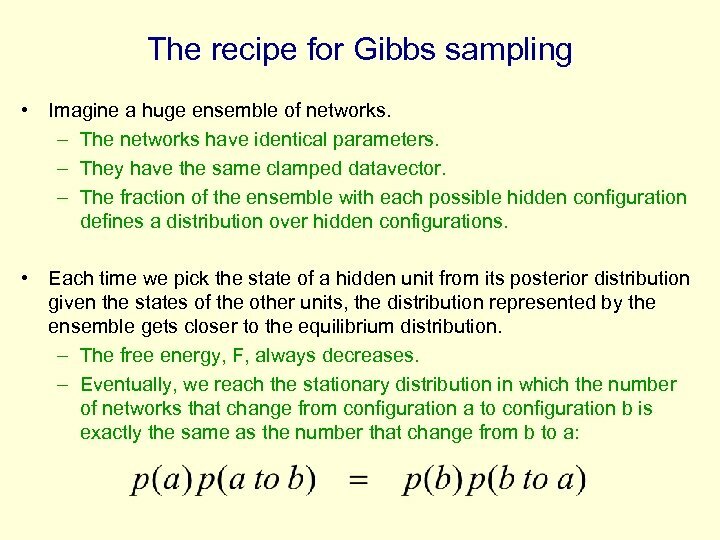 Sampling from the posterior distribution • In a densely connected sigmoid belief net with many hidden units it is intractable to compute the full posterior distribution over hidden configurations. – There are too many configurations to consider. • But we can learn OK if we just get samples from the posterior. – So how can we get samples efficiently? • Generating at random and rejecting cases that do not produce data in the training set is hopeless. 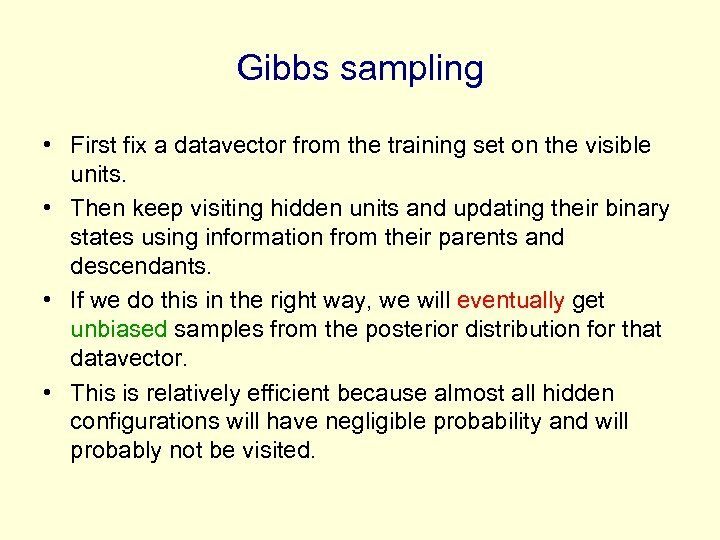 Gibbs sampling • First fix a datavector from the training set on the visible units. • Then keep visiting hidden units and updating their binary states using information from their parents and descendants. 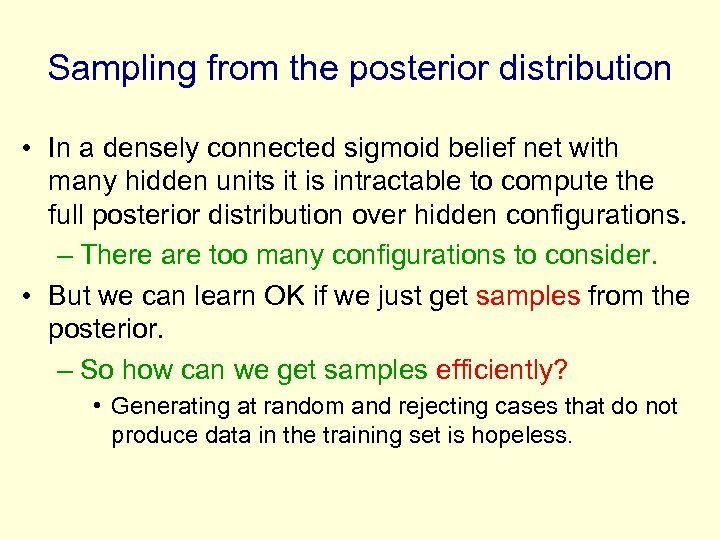 • If we do this in the right way, we will eventually get unbiased samples from the posterior distribution for that datavector. • This is relatively efficient because almost all hidden configurations will have negligible probability and will probably not be visited. 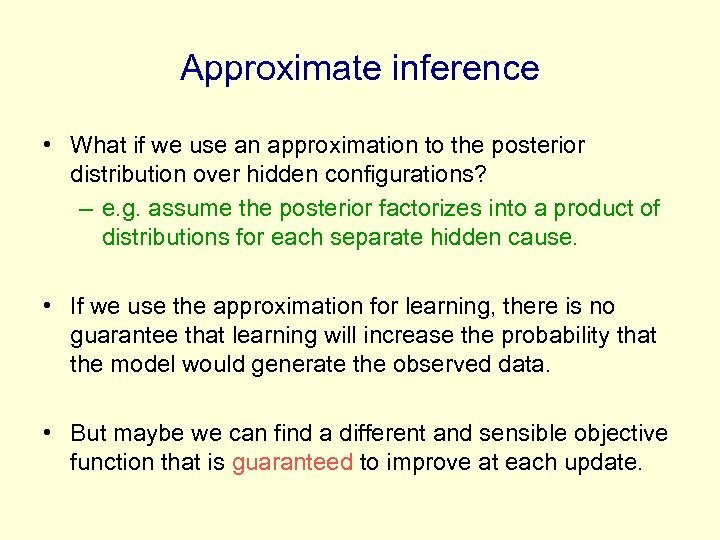 Approximate inference • What if we use an approximation to the posterior distribution over hidden configurations? 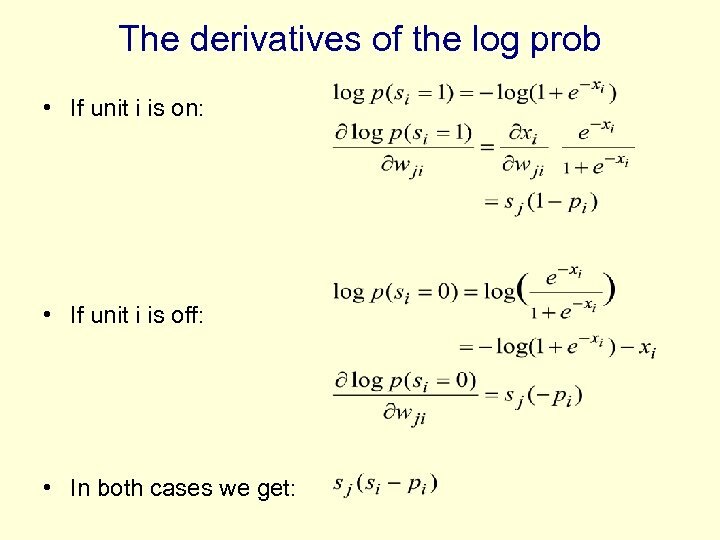 – e. g. assume the posterior factorizes into a product of distributions for each separate hidden cause. 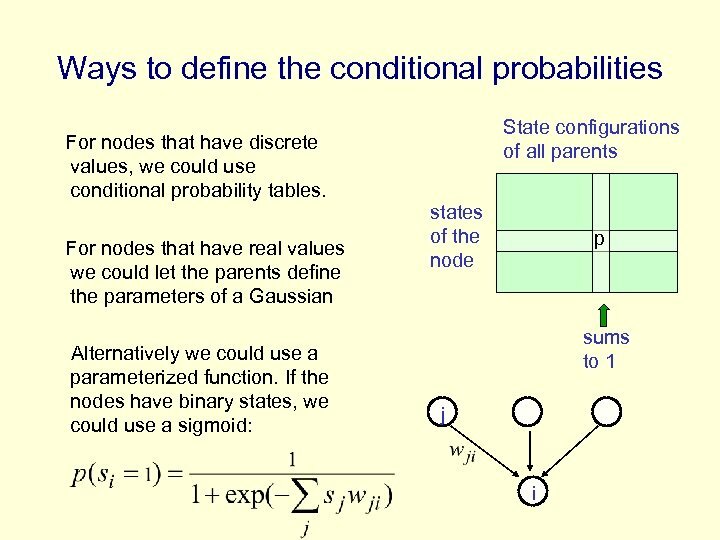 • If we use the approximation for learning, there is no guarantee that learning will increase the probability that the model would generate the observed data. • But maybe we can find a different and sensible objective function that is guaranteed to improve at each update. 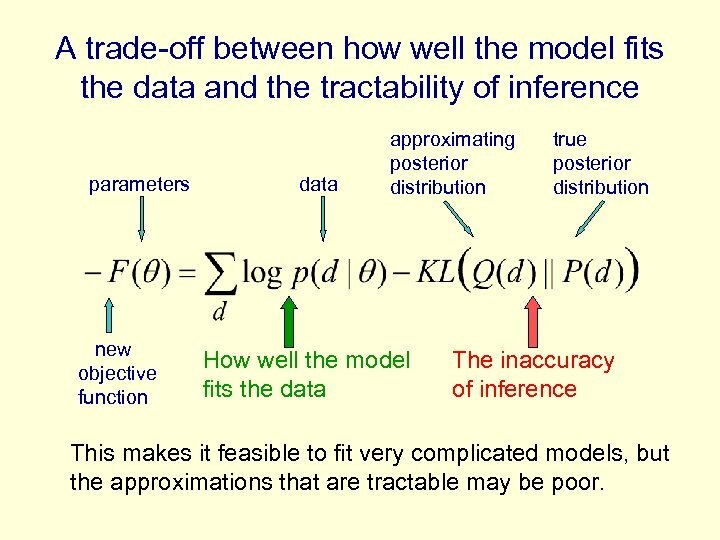 A trade-off between how well the model fits the data and the tractability of inference parameters new objective function data approximating posterior distribution How well the model fits the data true posterior distribution The inaccuracy of inference This makes it feasible to fit very complicated models, but the approximations that are tractable may be poor. 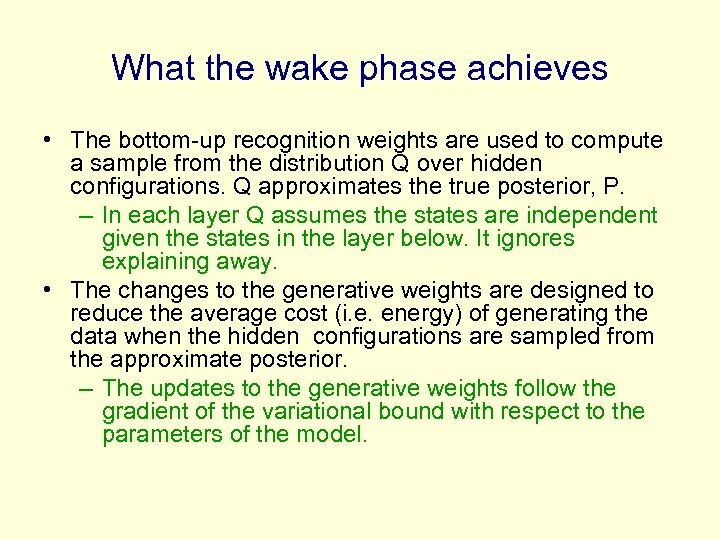 What the wake phase achieves • The bottom-up recognition weights are used to compute a sample from the distribution Q over hidden configurations. Q approximates the true posterior, P. – In each layer Q assumes the states are independent given the states in the layer below. It ignores explaining away. 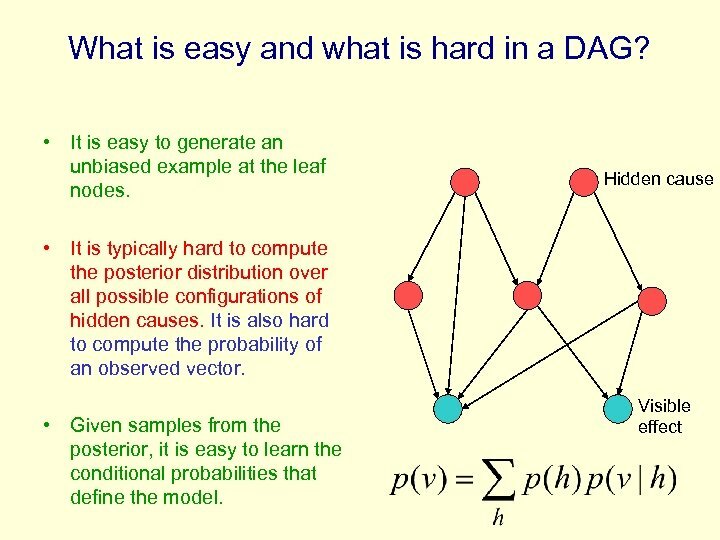 • The changes to the generative weights are designed to reduce the average cost (i. e. energy) of generating the data when the hidden configurations are sampled from the approximate posterior. – The updates to the generative weights follow the gradient of the variational bound with respect to the parameters of the model. 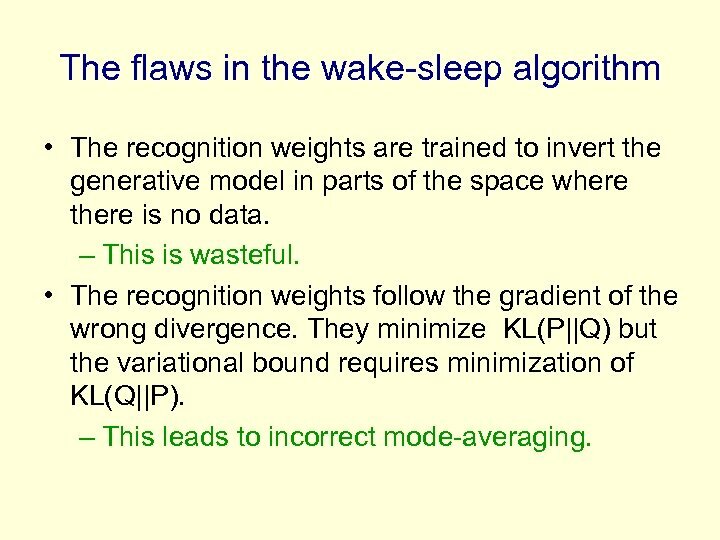 The flaws in the wake-sleep algorithm • The recognition weights are trained to invert the generative model in parts of the space where there is no data. – This is wasteful. • The recognition weights follow the gradient of the wrong divergence. 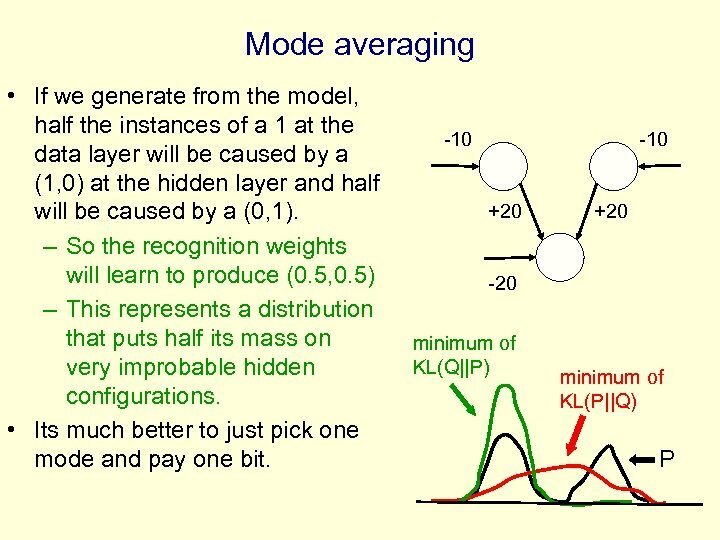 They minimize KL(P||Q) but the variational bound requires minimization of KL(Q||P). – This leads to incorrect mode-averaging. 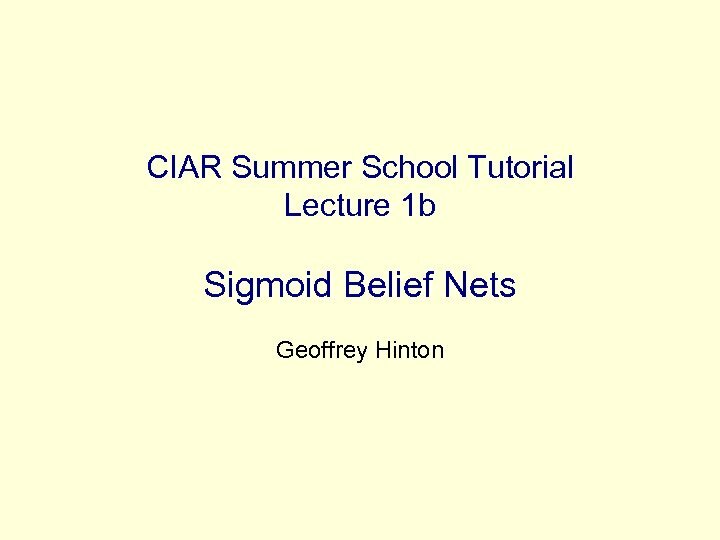 Summary • By using the variational bound, we can learn sigmoid belief nets quickly. 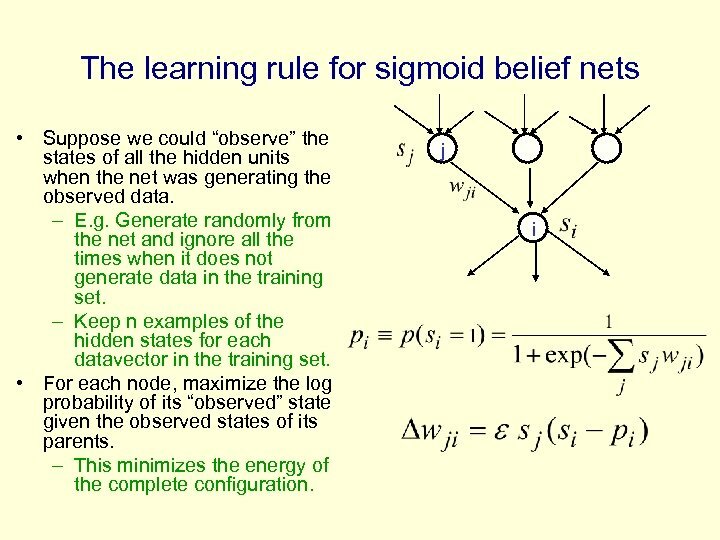 • If we add bottom-up recognition connections to a generative sigmoid belief net, we get a nice neural network model that requires a wake phase and a sleep phase. – The activation rules and the learning rules are very simple in both phases. This makes neuroscientists happy. 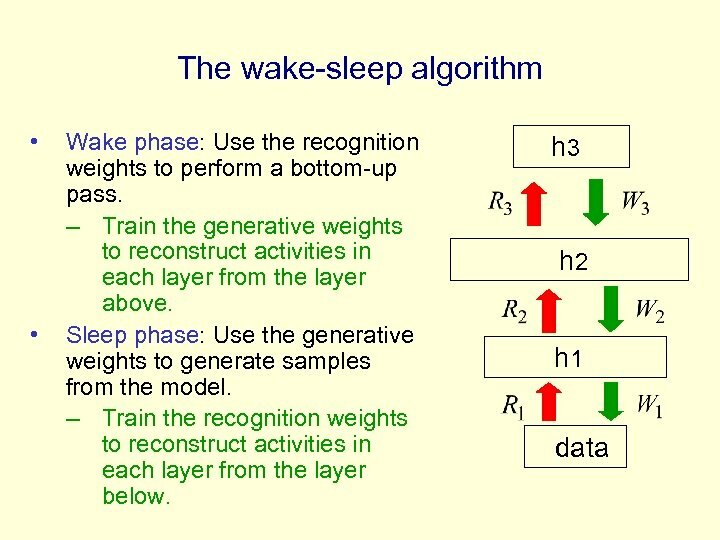 • But there are problems: – The learning of the recognition weights in the sleep phase is not quite following the gradient of the variational bound. – Even if we could follow the right gradient, the variational approximation might be so crude that it severely limits what we can learn. 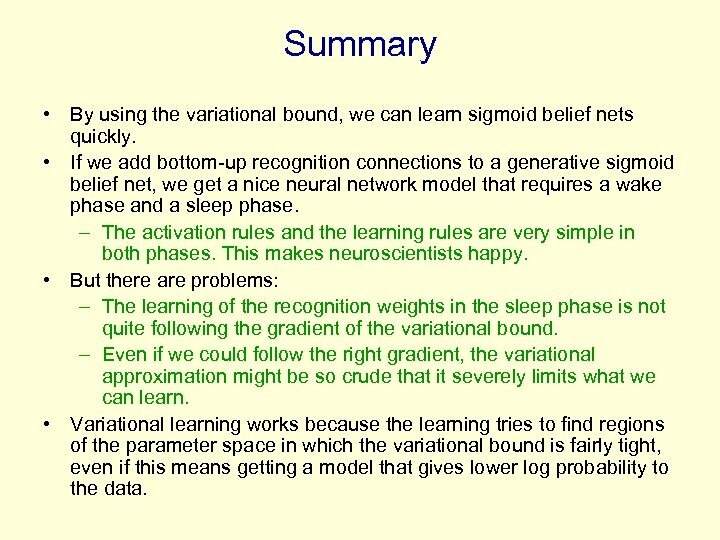 • Variational learning works because the learning tries to find regions of the parameter space in which the variational bound is fairly tight, even if this means getting a model that gives lower log probability to the data.